A 48-page newspaper and 40-page stand-alone books review magazine featuring writing, art and photography inflected by the workings of innovation, creativity and resistance. 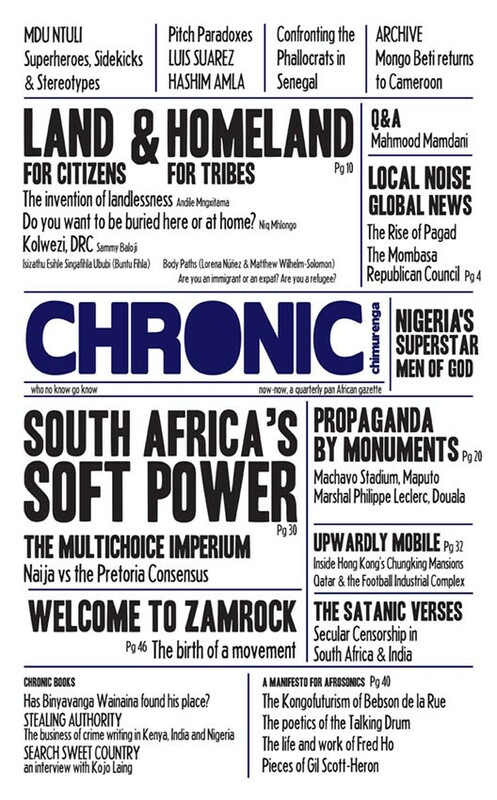 Jean-Pierre Bekolo, Binyanvanga Wainaina, Dominique Malaquais, Mahmood Mamdani, Andile Mngxitama, Gwen Ansell, Patrice Nganang, Achal Prabhala, Rustum Kostain, Karen Press, Niq Mhlongo, Paula Akugizibwe, Tolu Ogunlesi, Sean Jacobs, Harmony Holiday, Howard French, Billy Kahora are a few of its many contributors from around the world. Stories range from investigations into the business of moving corpses to the rhetoric of land theft and loss; from latent tensions between Africa’s most powerful nations to the soft power of the biggest satellite television provider; and from the unspoken history of Rushdie’s “word crimes” to the unwritten history of PAGAD. It also investigates crime writing in Nigeria, Kenya and India, takes score of the media’s muted response to the ‘artistry’ of the World’s No1 Test batsman, rocks to the new sound of Zambia’s Copper Belt and tells the story on one man’s mission to take down colonialisms monumental history. Order the print edition from one of our stockists or direct from our online shop. I am extremely excited about this publication! !